Take a look at this painting. You might think it’s the most amazing painting in the world, you might think it’s awful. Whatever you think about it is your business. What I’d like to share about this painting, and for that matter all art, is the transformative nature of an image, a song, a poem. I really believe in the power of art to transform us, often in quite magical ways. Beth is 63. Her mother died when she was 2 years old. Her father, a lorry driver, left her in the care of a local woman who was cruel and abusive to her and her two older sisters. When she was 10, she and her sister tried to run away. They were caught and taken back home, but at least Dad now knew what had been going on, and sacked the bully. She was 14 when her father remarried. This was to a woman Beth liked a great deal. Beth thought things were taking a turn for the better, and the family she had dreamed of having was now finally coming together. Dad died a year later in a traffic accident. Her stepmother tried to be a Mum to the girls, but it was a fraught process as they had little shared history and she was mourning the death of Beth’s father too. Beth left school with one O-Level and moved to London where she started working as a secretary, and then, over the years became a valued member of a large HR department. She is now retired. Beth is incredibly intelligent, sensitive, self-aware, and very accomplished at pleasing others: going the extra mile to make other people happy. For over three decades now, Beth has been married to Peter who is five years younger than her and works as a business consultant. They have a son in his late 20s. Peter has cheated on Beth during their marriage. She has found these betrayals devastating, leading to both physical and mental ill-health in both cases. They have had couples counselling. She has tried to work through this with him. Although their marriage wasn’t perfect, as no marriage is, Beth has loved Pete and their somewhat one-sided, co-dependent relationship: him calling the shots, and her abiding largely with his needs. At least until a month ago, when Beth found a (paper) folder in which Pete had filed all the emails he’d sent to his last batch of paramours, including all his hotel and restaurant receipts. Beth has decided that Pete will never be able to commit to a monogamous union and she is now divorcing him. What has this got to do with the painting you ask? As you can imagine, the divorce and the tearing up of their family home is incredibly hard for Beth. She comes to our sessions in pieces and walks out of them, slightly more together, but still very broken. I have encouraged her to find words that speak to her in this place of despair, and she found this poem which gave her some solace. In our last session though, she arrived with a card bearing this image. And a story of how she and the painting had met. 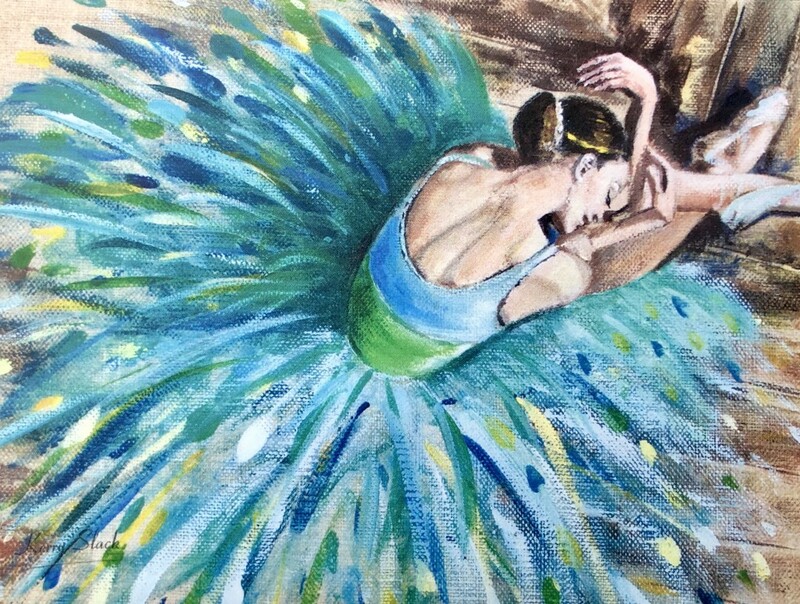 She’d been sitting in a local coffee shop feeling lost in painful thought when she looked up and saw this image of a ballerina which spoke to her. She wasn’t sure how or why, but on reflection, we surmised that perhaps it was perhaps that combination of fragility, but also strength, of a kind of turning-in, back to oneself (I’m thinking here of Walcott’s Love After Love) that felt like a balm for her soul. She stared at the painting for ten minutes or more, and then asked the waitress if any of these paintings were for sale. They were: a local artist, who agreed to sell Beth the painting. Pete has refused to move out of their shared house while divorce proceedings go ahead. Beth cannot stand being in the same house with him anymore, so has decided to rent a small studio flat before thinking about where she would like to go next. “This painting is the the first thing I’m going to hang in the flat,” Beth tells me. “And I know that every time and every day I look at it, it will bring me peace and joy and consolation.” Her somewhat bossy older sister doesn’t think much of the painting and believes Beth paid too much for it (the painting cost her 350 pounds), but Beth doesn’t care. She knows it’s worth every penny. And I think so too. My mother is an artist, a vocation which she stumbled upon in her third age, just a few years younger than Beth is now. She also sells her work to people who fall in love with her images online, or in some of the small galleries that have displayed her paintings. If you paint, make music, write poetry, or whatever your creative outlet is, know this: your work matters. Even if it only matters to your family, or to yourself, or to a complete stranger who experiences something of your life-force in the work and something in them shifts in the process.